Grace Fortune knows that her boyfriend is dead and she watched him die, but then she continues to hear his voice. Is she going nuts or did he really die? How about the boy who walks and acts like him, the boy who seems connected with the homeless man that Grace suspects to be her father? Grace has many questions about Jared Lorn’s death and as she and her friends begin to investigate, they are plunged into a world filled with mystery and darkness — Silo City. Grace is caught up in a web of conspiracy involving her mother, the boyfriend who died, and a rock star called Lester Crow. It’s a world where nothing is as it seems and where darkness lurks at every turn. When her life is in the gravest danger, Grace finds revelations that are mind-blowing. 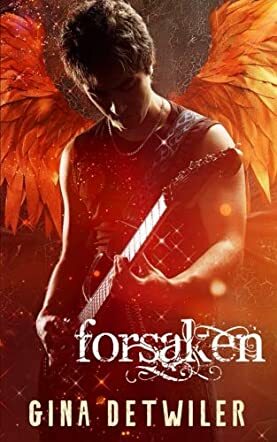 Forsaken is the second book in the Forlorn Series by Gina Detwiler, an interesting paranormal tale with dark themes and romance. Gina Detwiler is a great writer with a gift for plot and character. Her characters are real and she does an impeccable job in exploring their hearts. The author allows readers to feel the conflict in the characters. The prose is highly descriptive, and while it offers vivid images of the setting to readers, it gives a clear view of characterization and the action taking place. For instance, when Grace talks about Ollie, she describes him as “a tuba player for the school orchestra. He’s kind of shaped like a tuba, rounded and flaring in all the wrong places, with a mop of shaggy hair that sticks up every which way, like he’s been recently electrocuted.” The prose itself is enjoyable, the writing deft and balanced. Forsaken is a great story for readers who love emotionally rich stories with quick action and a powerful conflict. A gripping tale that features supernatural powers colliding with each other.